So last week NCRS college intern Jake took his field trip to North Dakota. He was met in Bismarck by Sales Account Manager Brad and Field Agronomy Manager Reid. From there they went down to the extreme Southwestern part of the state to Bowman, home of AgroLiquid Retail Partner Southwest Ag (well what else would it be called?). They spent the next several days travelling with some of the Southwest sales agronomists visiting customers both in the Bowman area and near their other site in Mandan, next to Bismarck. MSU student Jake said that many of the crops looked good but some had been hampered by dry weather and hail. Now that’s a cruel combination. That’s Jake on the right. In other news…the NCRS has long been Environmentally Verified by the Michigan Agriculture Environmental Assurance Program (MAEAP, or pronounced “Meep” in conversation). This is a state program that recognizes farms that keep good spray, planting, application, et al, records, safe storage of pesticides, containment of fertilizers, irrigation records and all of the things that make a farm a good neighbor. The NCRS passed inspection the other day and was awarded an updated sign, held by NCRS department manager Jay. This one is cool because it is one of those that shine brightly at night from headlights. Look for it on your next visit. Come at night for the ultimate sign experience. Well the winter wheat research plots have all been harvested, but there were still some production acres awaiting harvest. Here is our fearless leader Troy taking the helm of the combine, having a last conversation with truck driver Ron. And he’s off. This actually is some soft red winter wheat. In general, these kernels are a major ingredient of flour used by private companies that bake cookies. Yummm. Faster Troy. There’s cookies to be made! Drove by our vineyard that is looking good this time of year. You can see some green bunches in the foliage. These are Concord grapes, and thank goodness we have drip irrigation. Now here’s an odd picture, also at the AgroExpo site on Farm 12. We noticed on a plot area planted to soybeans in 15″ row spacing, that every other row was showing severe potassium deficiency while the other rows all looked fine. Hmmm. This soil is quite low in soil test potassium (STK), but even stranger is that there was no fertilizer applied at planting or any other time. Hmmm #2. What’s up with that I wondered? Come to the AgroExpo and learn more. So it has been a busy week, and it’s still not over. And just to be fair we make comparisons with conventional fertilizers like urea here. This applicator, nicknamed the Blower, has been shown many times in previous blog posts. But it is still a work of art originally crafted by Doug Summer when he was at the NCRS. It has a PTO driven turbine fan to propel the granules out the back. It is calibrated for the different rates applied and is also used for other dry fertilizers in other experiments. So while I was in OK last week, Reid and I also had the chance to see some Liquid in action on some grower’s fields. Here we are down near Cordell still in SW OK. This year the cotton crop looks outstanding thanks to some timely rainfall and lower temps (that is, not so oven-like) during the season, plus good nutrition. Area Manager Parker holds a typical cotton plant just loaded with bolls. This was not a selected giant, but a typical one in this field that received a planter application of 3 gal/A of Pro-Germinator + 1 qt/A of Micro 500 + 15 gal/A of High NRG-N. It was applied in a surface band about an inch over from the closed furrow. Parker is also a custom applicator who made a foliar application of a ferti-Rain + eNhance + Iron blend at a volume of 3 qt/A. Here they are in another field of the same grower. It too looks good and full of bolls as Parker enthusiastically explains. However directly across the road is a field of another grower. Obviously not as good as the other one. In fact, Parker has nothing good to say here and keeps his arms folded. there are two main factors working against this field. One is that it didn’t have Liquid fertilizer. And two is that this was grown under conventional tillage, whereas the first field was under No-Till. I really don’t understand why growers would work ground in a state where soil moisture is so precious. Look at the good No-Till/Liquid field again where there is sizable growth and you can still see crumbling milo stalks from the previous crop. This saves moisture, money and soil biology. We also looked at some recently planted No-Till wheat that was planted early for wheat pasture. Pro-Germinator + Micro 500 + 3 to 4 gal/A of High NRG-N through the drill gets the wheat off to a fast growing start. A little rain would sure be beneficial, but the Liquid and No-Till are keeping it at it’s best. I was impressed by the large number of pods present. But a little rain would be nice to ensure maximum production. Here is some of Todd’s own ground that is planted to wheat for pasture. He used 4 gal/A of Pro-Germinator + 1 qt/A of Micro 500 + 3 gal/A of High NRG-N through the drill. He will put on some more High NRG-N in December or January as a topdress. But it is growing good and strong and will make great pasture soon. Note the water tower in the background. Here is another field that received broadcast dry fertilizer, likely DAP and urea, and tillage to work it in before planting. Won’t people ever learn? It was planted at the same time as the neighboring field above. (See the water tower for reference.) Cows will have to tighten their belts for awhile before being turned out in this pasture. While in Oklahoma, I had to venture over to McLoud, which is around 40 miles East of Oklahoma City, to see my old friend Jake. Whatever happened to him, you ask? Well is is completing his first year back on the farm. And it was a good one for corn. Although no one is happy about the low price, at least if the price is low you better have lots of bushels per acre. And they certainly did. I don’t want to divulge numbers as it’s not my place to do that. But their farm average was right at the earlier estimates for the national average, which is outstanding for dry Oklahoma. 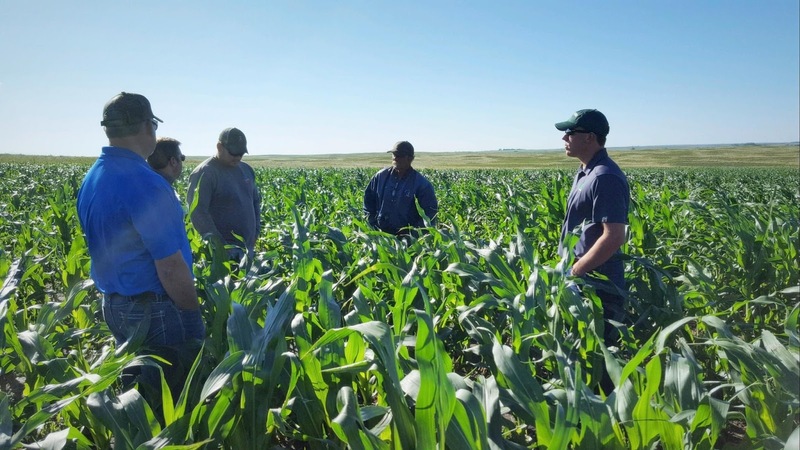 Planting a low population of under 20k plants per acre, he applied an in-furrow application of Pro-Germinator + Micro 500 to get a good start and a strong finish in the favorable conditions of the summer. Here we see him unloading some corn from a bin to take to market. Because this is going to a large dairy that sells their own milk and ice cream, an aflatoxin test is required. Aflatoxin is a mold that can affect the corn, and a dairy has a zero tolerance for it. Jake said it is an expensive test, and they bought their own test kit. You have to bring the indicator strips with the load of corn. It was negative. I had not seen this test before, but Jake is a good chemist when it counts. I rode over to Tuttle, OK with Jake and the corn. It was a short trip so I didn’t get to try out the sleeper. Jake makes sure that every Liquid-fed kernel goes into the pit. And fortunately I was able to attend a Cowboy football game later in the week and watch the home team pummel the Red Raiders of Texas Tech 45-35. Good crops, good people and a great game. Sounds like a complete week to me. Compare different AgroLiquid fertilizer application timing compared to University of Maryland recommendations for effect on winter wheat yield. The effectiveness of AgroLiquid fertilizer programs has been well demonstrated in a variety of tests across the country. But not every grower has a drill set up for application of Liquid fertilizers which has led research of other methods of application. Other options are broadcast to the soil ahead of planting and application after wheat emergence in the fall. These treatments were compared to the same fertilizers applied through the drill at planting, and then also to a University of Maryland fertilizer recommendation. Treatment yields appear in the following chart. • Surprisingly, the highest yielding treatment was the pre-plant broadcast application of AgroLiquid fertility. However, the drill and post emergence applications produced yields very similar. • All AgroLiquid applications were higher in yield than that of the University of Maryland recommendations. • This similarity in yields from the different methods of application will enable flexibility for growers to enable matching fertility programs to what works best for them. and 2 gal/A access was compared to 4.25 gal/A Pro-Germinator with 2 qt/A Micro 500. These programs were also compared to a conventional fertilizer program of 10-34-0, ATS, Manganese and Zinc. Yield results appear on the chart below. • All fertilizer treatments increased wheat yield over the nitrogen only treatment. • Although the soil test program did have a higher yield than the other fertilizer programs, it was not statistically significant. Similar treatments have been evaluated in the past at the NCRS with a 2 bu average yield advantage to the soil test program. In all cases, the additional fertilizer costs were not covered by the yield increase. • The addition of access to the fertilizer program did not influence yield. • The conventional program yielded similar to the other fertilizer programs. Long-term comparison of the methods of application on wheat yield. Three years of testing at the NCRS has shown consistent results when it comes to method of application options for winter wheat. For comparison: preplant broadcast, drill applied, fall foliar on 2” growth and spring topdress were evaluated. Soils at the NCRS are in the mid to high levels for phosphorus, so limited inputs are required. This combined with the shortened fall growing season before dormancy provides more options for timing. • For three years in a row, the NCRS has shown there is little difference between placement options on winter wheat. • Areas with more fall growing time and requirements of more phosphorus, it may be necessary to have nutrients on sooner to provide best yield results. qt/A Micro 500 and 2 gal/A access. All treatments also received a spring topdress application of 28 gal/A High NGR-N.
• As seen in past testing at the NCRS, there is no statically significant difference between the four methods of application. • With similar results seen amongst all treatments, growers have options on when they can apply their phosphorus in these northern climates. Areas with known low soil phosphorus levels where risk of deficiencies occur, apply nutrients in the fall in order to prevent stress to the crop. 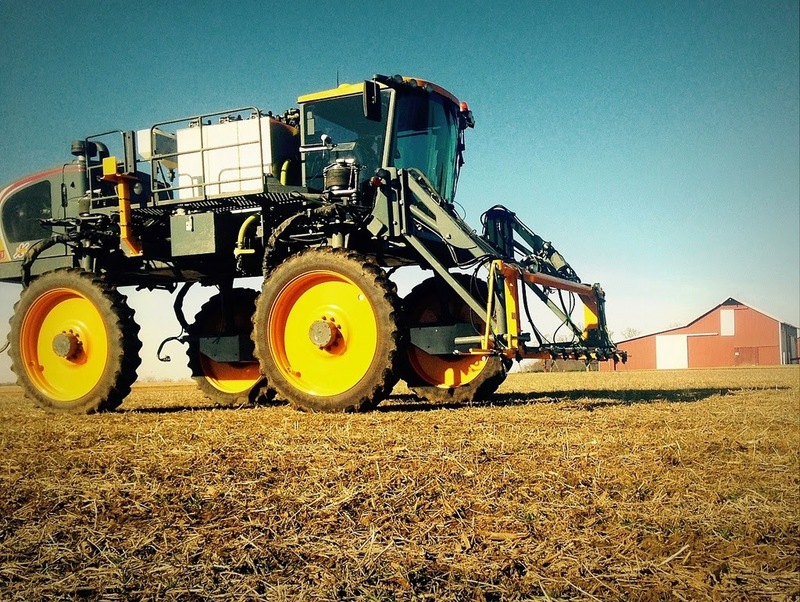 To evaluate the timing of High NRG-N topdress applications on soft red winter wheat yields. A commonly asked question is will High NRG-N perform better if it is applied earlier than normal in a winter wheat topdress method of application? This question arises because of the unique N-release characteristics of High NRG-N. By using the normal application date of the first of April, there are still 90 days until the end of June to make use of all available nitrogen. This test was conducted to see if that timing of early April would meet the nitrogen needs of the winter wheat and also to acquire information if the early topdress timing would enhance yield. •The best time to topdress winter wheat is at dormancy break around early April in Michigan. This timing proved a significant yield advantage over an early or late application. • A delay in topdress application significantly lowered the yield below the early and normal application timing. • An early High NRG-N application did not prove to benefit wheat yield. the equivalent of 120 lbs of N/A. However, due excess rain and cool temperatures in April, yields were lower than expected. These conditions may have caused a loss in nitrogen. Results from this experiment appear on the chart below. • In this non-irrigated experiment, similar yield was achieved with both of the nitrogen sources reaching a wheat yield of around 77 bu/A. • These results are consistent with what we see in the field. In dryland situations with average growing conditions, yields with High NRG-N are comparable to those achieved with 28% + eNhance. To evaluate topdress nitrogen sources for effects on winter wheat yield. A nitrogen source comparison with sulfur additive experiment was conducted at the North Central Research Station. High NRG-N and 28% UAN were compared at recommended rates with the additions of sulfur sources: eNhance, accesS and S-Calate. An experimental fertilizer, NF-13, was also included. Yield results appear on the chart below. • There was no significant yield difference between the recommended rates of High NRG-N, 28% + eNhance and 28%. • The addition of sulfur sources accesS and S-Calate to High NRG-N, did not provide additional yield benefit. High NRG-N already contains 1% sulfur, which may have been enough to meet the requirements for the crop. • The experimental product NF-13 did provide a slight yield increase but statistically insignificant.